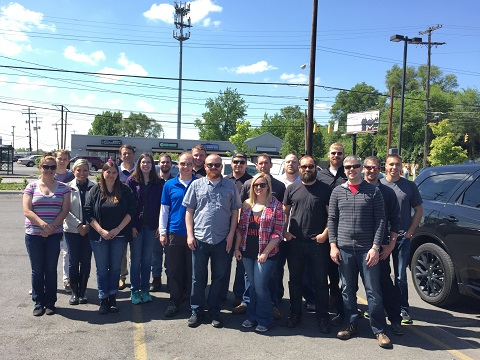 Members of Nationwide Energy Partners’ Energize Columbus organization took part in their first Keep Columbus Beautiful Adopt-an-Area cleanup on Wednesday, May 18. Twenty NEP employees traveled to the historic Driving Park/Hanford Village area off of East Livingston Avenue and spent the morning picking up litter along a 150-yard stretch of South Nelson Road. Volunteers also helped pull weeds and pick refuse out of the landscaping around the Livingston Streetcar District sculpture. Keep Columbus Beautiful promotes the Adopt-an-Area program for the City of Columbus to promote cleaner, more livable neighborhoods. Groups, businesses, churches, schools, families or individuals may adopt an area. Groups that adopt an area will clean the area at least two times per year over a two-year timeframe. Keep Columbus Beautiful supplies groups with trash bags, gloves and other tools on loan to assist efforts at no cost.